Home › Newsroom › Updates › From Demonized to Organized is now available as an e-book! CCPA’s popular book on young workers, unions, and challenging neoliberalism is now available as a digital download for Amazon Kindle and iBooks! 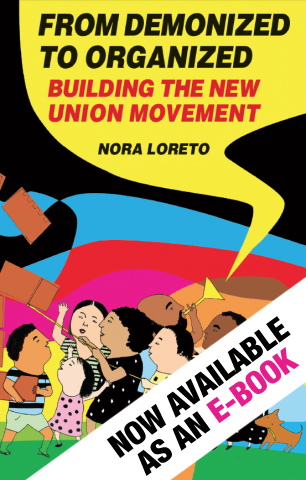 From Demonized to Organized: Building the New Union Movement, by Nora Loreto, explains unionization and the labour movement for a younger generation, and covers a lot of ground, including: the benefits and responsibilities of union membership; government attacks on workers' rights; the harms of neoliberalism; new ways of organizing; and more. The book is also a reminder to unionized workers that many of the truths that they take for granted are not obvious to others, and that the labour movement must change how it reaches out to its members, its communities and to non-unionized workers if it hopes to grow. Are you in the United States? You can download our e-book from the iTunes U.S. store or from Amazon.com.